One of my HP 16500B logic analysis systems has a 16534A digital oscilloscope module installed. The module has a great specification: two channels, 2Gsamples/sec, 500MHz analogue bandwidth, and 32k record length. I would find it a really useful debugging tool, if it worked properly. Sadly it doesn’t. 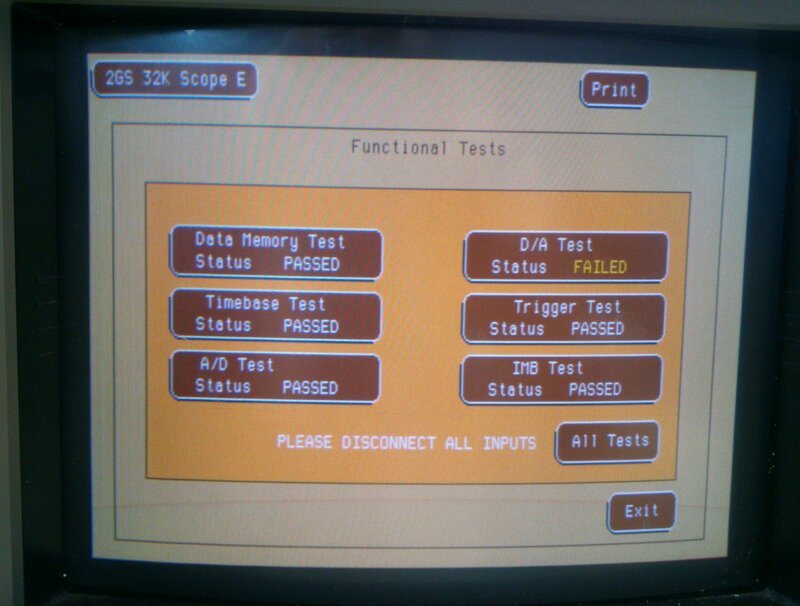 Though it displays a trace successfully, and the controls work, it won’t trigger. The only way I get a trace is by auto-trigger. In this case the trace isn’t synchronised, so it’s impossible to catch a particular event at a particular time. Here it is displaying a square wave (well, it’s nearly square – I hadn’t adjusted the probe compensation so it’s a bit curvy on the top and bottom). Adjusting the trigger level just doesn’t make any difference. Test DAC This test verifies the correct operation of the D/A convertor on the board. 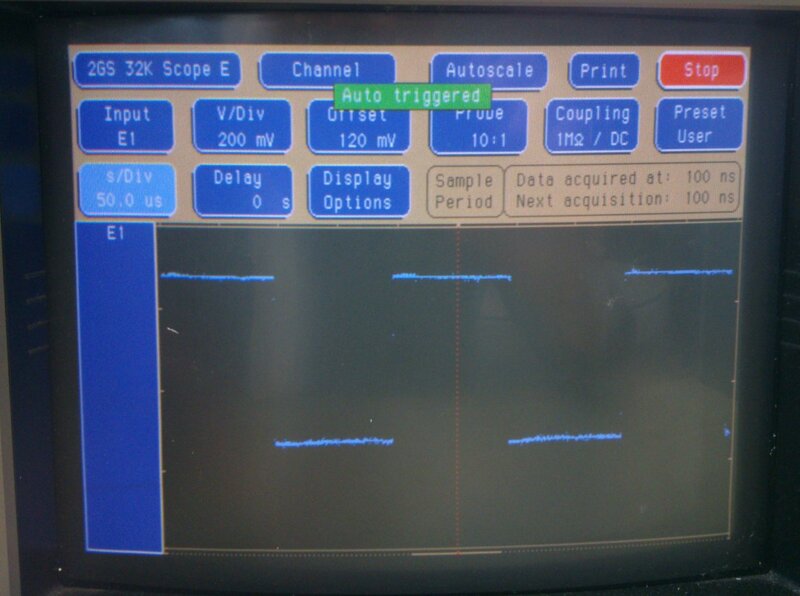 detection of a correct trigger indicates that the D/A convertor is operating normally. It’s an AD96687 from Analog Devices, which is a dual high-speed comparator with ECL outputs. If I was designing a high-speed trigger circuit using 1994-vintage components, I might use a device like this. I’ve had a look at all its pins with the power switched on and a signal applied and tests running, and none of them seem to change at all. One noninverting input is stuck at +5V, and the other inputs are near ground. One set of outputs isn’t even showing valid ECL logic levels, but it may be unused and thus have no load resistors on it. Maybe it’s a red herring and nothing to do with the triggering at all, but I’m suspicious that I never see anything change. Without more circuit information, it’s hard to get much further, sadly. 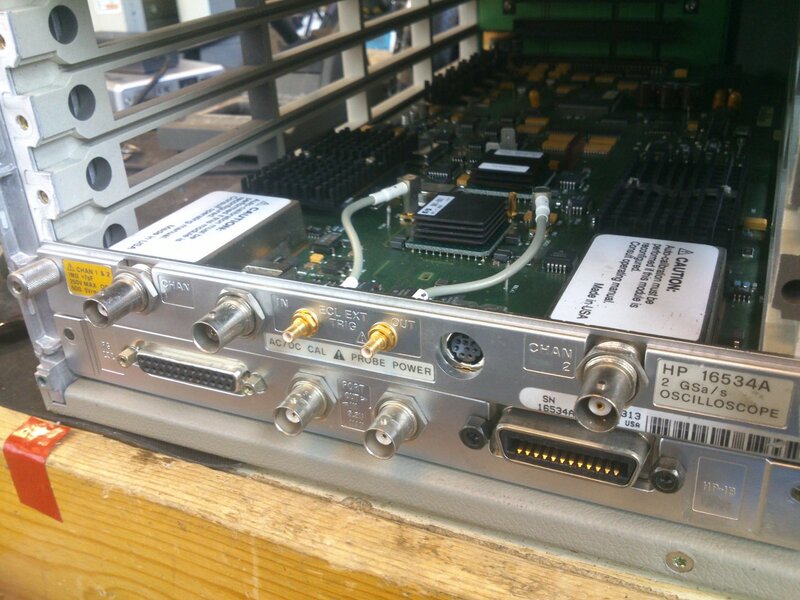 This entry was posted in HP 16500A/B and tagged 16500B, electronics, hp, test equipment on April 3, 2013 by martinjonestechnology. Recently I’ve been putting a couple of HP logic analysis systems into action. Accumulated from various places over the last couple of years I have both a 16500A and a 16500B. They’re remarkable units which take a whole variety of plugins for doing high-speed digital and analogue measurements. They must have been eye-wateringly expensive when new and, as a result, have such high specifications that they’re still useful even though they’re around 20 years old. For example, the 16500B boasts a colour touch-screen, a built-in hard drive and Ethernet. It was launched in 1992 when many desktop PCs didn’t have those features, so it must have seemed awesomely high-tech at the time. Here’s a picture of the 16500B. 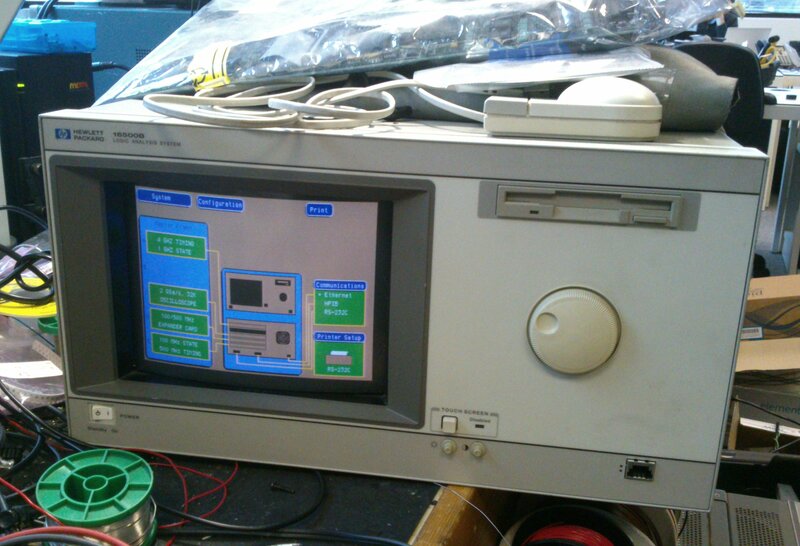 The 16500A is similar but looks…older. There are a few quirks to using these machines in 2013, and I’m intending to write about some of my experiences here. 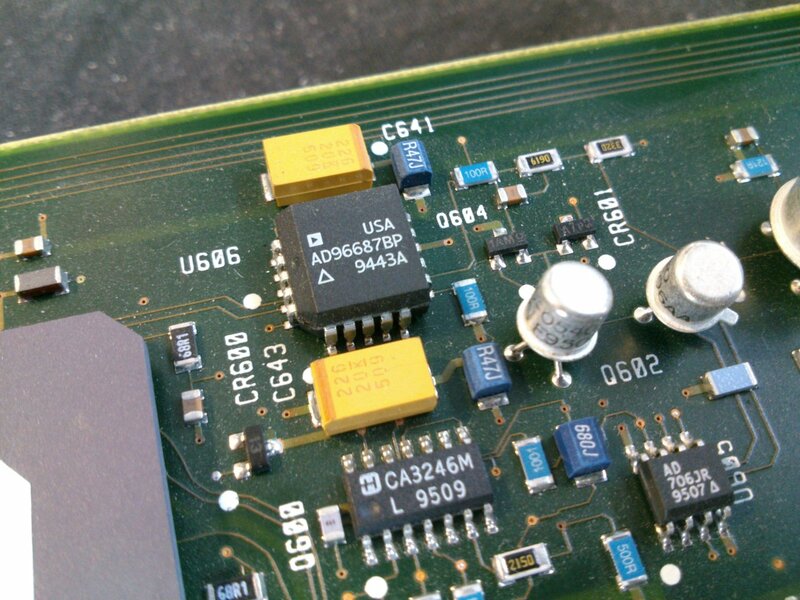 This entry was posted in HP 16500A/B and tagged 16500A, 16500B, electronics, hp, test equipment, vintage on January 12, 2013 by martinjonestechnology.